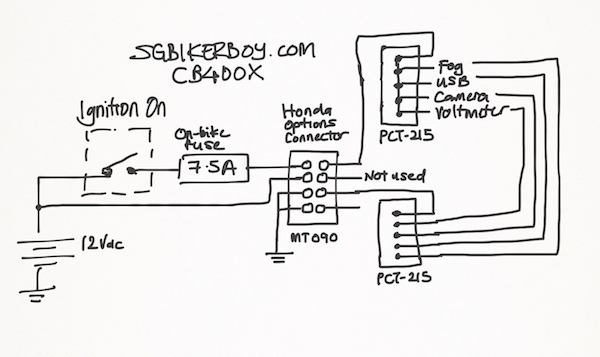 Having recently purchased the Honda CB400X, I’d love to have the option of adding on electrical accessories. I have previously wired up my Pulsar 200NS and added a relay and a fuse to help isolate the circuit from the rest of the bike’s electrical system. 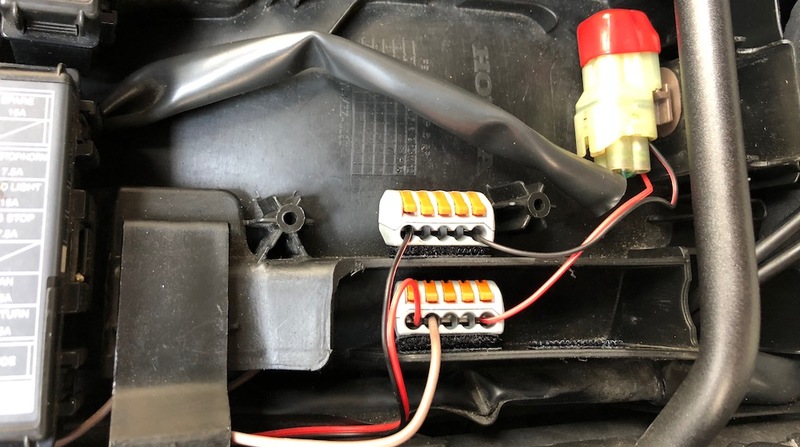 The main reason being that if an add-on accessory fail and short circuits, you don’t want it to affect the bike’s other electrical system. 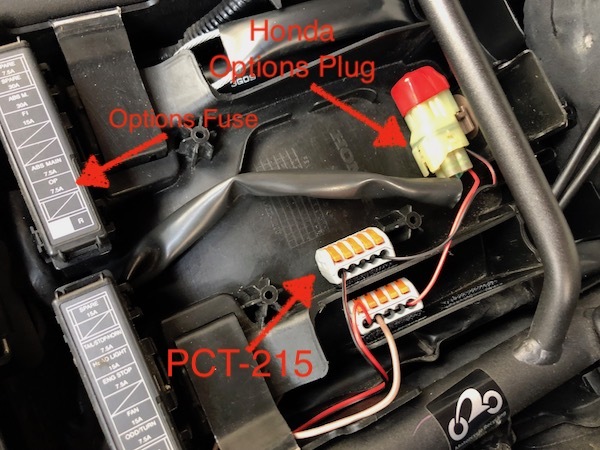 While researching on how to wire up the CB400X, I realised that Honda has already included a fused ignition-on feature built into the bike! No messy relay needed! And this is done via the 4-pin MT090 options plug found underneath the seat. That’s easy! All I really needed to do is to get some MT090 connectors to hook up to the Options Plug and then wire it to a couple of PCT-215 connectors for power distribution. For higher power devices such as the fog lights, I’ll add an additional in-line fuse for protection. This is how the Options Plug, the 7.5A OP fuse and the PCT215 connectors are wired up on my bike. There are FOUR wires on the MT090 Options Plug – PURPLE, RED, GREEN and GREEN. PURPLE supplies 12VDC when the ignition is turned on; RED is always-on 12VDC; and the two GREEN wires are basically electrical ground. Interestingly, when I measured the supplied 12V voltages (both the PURPLE and the RED), they seem to be about 0.3V lower than that measured directly across the battery terminals. I suspect that Honda has placed a protective diode across the paths which contributed to that measured 0.3V voltage drop. In any case, that minor voltage drop is unlikely to affect the hooked up electrical devices. Viola! I now have a fused electrical tap-off point on the CB400X. Easy peasy! Bro how do you tap auxiliaries equipment like fog light and USB charger. I connect them up with electrical wiring? I’m sorry – I don’t quite understand your question here.